A video shows the men climbing up the building and helping the girl. 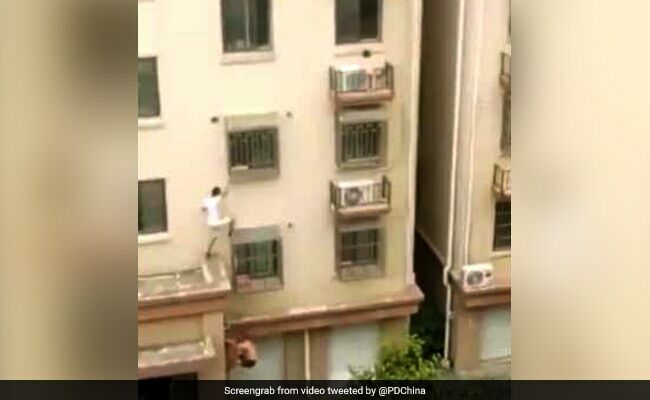 A child trapped on the fourth floor window of a building in China was heroically rescued by two men - they scaled the building through its windows to save her. A video of the incident proves that not all superheroes wear capes. According to CCTVPlus.com, the incident took place in Changshu, China's Jiangsu Province on September 7. The men were driving through the area when they noticed the girl and decided to rescue her. Turns out the little girl had been left home alone while she was sleeping. She had, however, woken up and managed to unlock the window. "I feel so grateful to the two heroes who saved my kid. I know that it was really dangerous even for the men themselves to climb up so high on the building," the girl's father told CCTVPlus.com. He was later given a warning for leaving his child unattended. In a similar incident last month, a superdad rescued his seven-year-old son who was dangling from the seventh floor of a building. According to reports, the child had climbed out through the window after fearing thieves had entered their house.